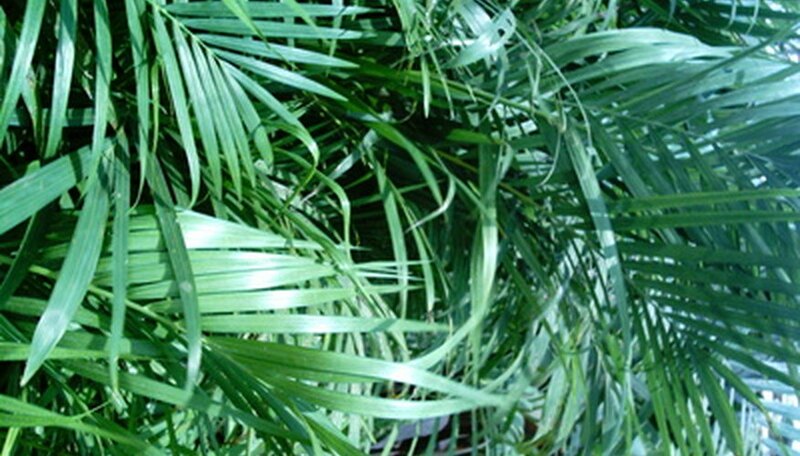 Miniature varieties of palm plants make suitable houseplants. As long as you can provide adequate light and moisture to these sun-loving plants, they will thrive in an indoor environment. Houseplant palms naturally develop yellowed and withered leaves over time, and an attentive gardener will remove this growth to keep the plant healthy and attractive. Cut dead palm fronds on a houseplant when they yellow and shrivel and your potted palm will continue to grow well. Check for yellowed growth often to ensure you are providing your potted palm with adequate moisture and light. Fronds turning yellow may indicate a palm needs more water. Yellowing tips are normal but you can remove these tips to keep your palm attractive. Cut away yellowed tips from the palm fronds with the scissors. Follow the natural shape of the frond and snip off almost all of the yellowed portion. By leaving a small border of yellowed leaf around the edge of the frond, you create an edge that may keep the frond from continuing to yellow. Prune off completely dead and dying fronds from the palm tree by cutting these fronds off between 2 and 3 inches from the central stem or trunk. Removing these leaves will not only improve the appearance of your palm houseplant, but it will also help the palm refocus its energy on healthy growth instead of trying to grow back unhealthy fronds.